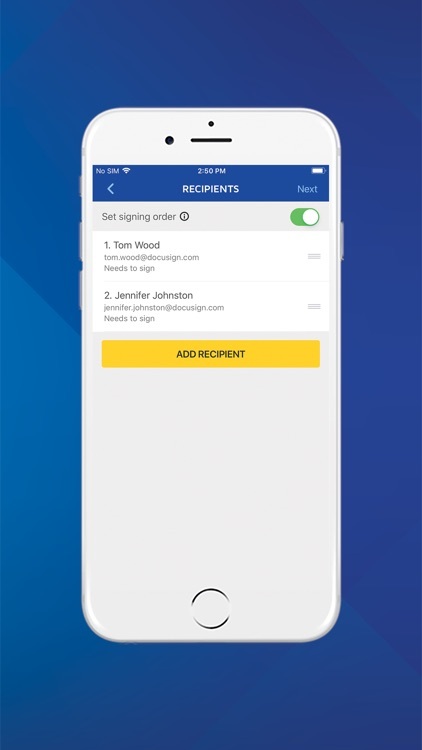 DocuSign is the easiest and most secure way to sign and get documents signed from your iPhone or iPad. 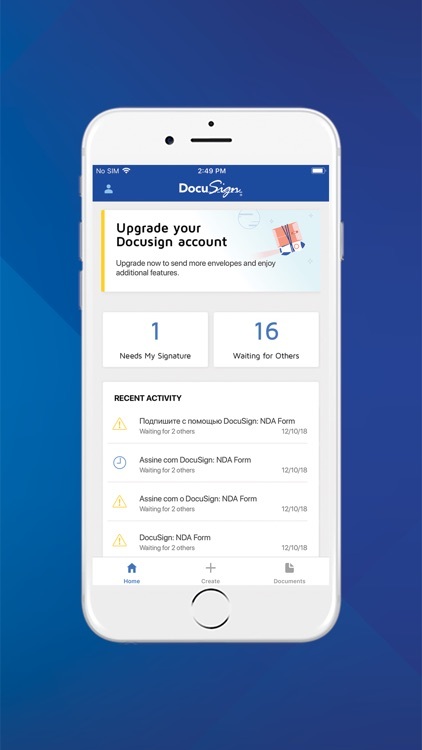 With over 50 million users worldwide, DocuSign is the most widely used eSignature and Digital Transaction Management platform in the world. 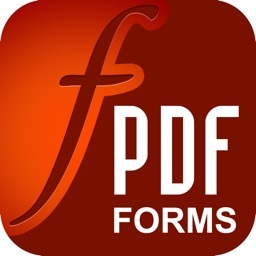 •	Fill out and eSign documents for free, there is no monthly limit. •	Send documents for others to sign. •	Securely store, manage, and access your documents from anywhere. 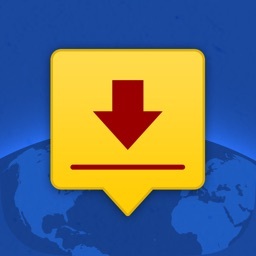 •	Send the complete document to anyone via email, Dropbox, Box, Evernote, Google Drive, and more. 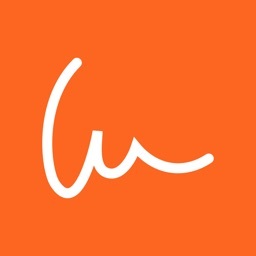 •	Create and customize your personalized signature right from your iPhone or iPad. 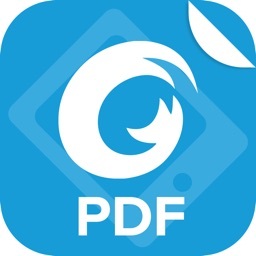 •	Supports PDF, Word, Excel, Images (JPEG, PNG, TIFF), Text, and more. 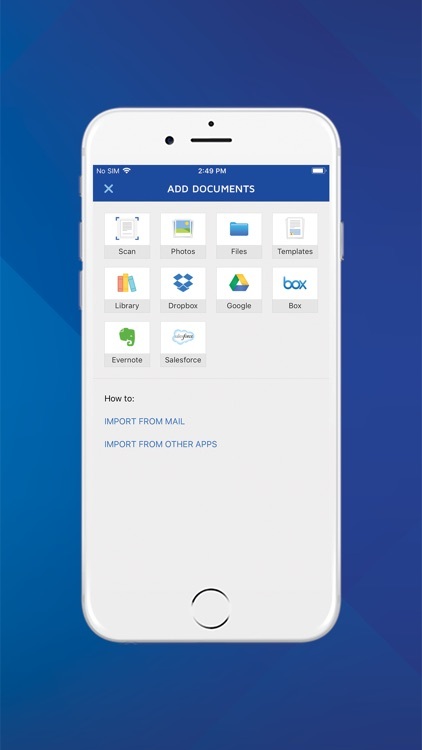 •	Open an email attachment in DocuSign or important documents from cloud services including Dropbox, Box, Google Drive, Evernote, and Salesforce. •	Offline access allows you to sign even when there isn’t internet connection – even on a plane. •	On-the-go features allow you to import and prepare a document entirely on your device. •	Guide your signers with “Sign Here” tags that show precisely where to sign, initial, or add additional information. •	Set the signing order and workflow for multiple signers. 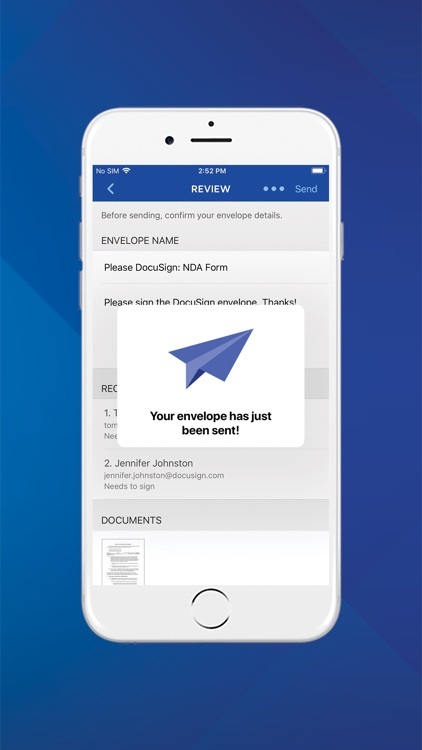 •	Receive real-time push notifications when a document has been signed. 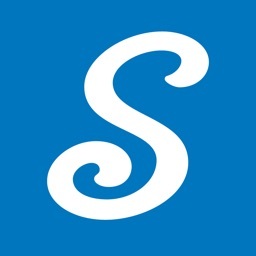 •	Remind signers a document is waiting for them to sign with a single tap. •	Void documents already out for signature. •	Supports both in-person and remote signing options. 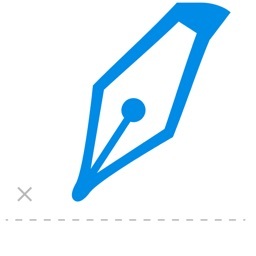 •	Legally binding—DocuSign’s legal signatures comply with the eSign Act. •	Complete audit trail to see who signed when and where. •	Documents are encrypted—safer and more secure than paper. •	DocuSign is ISO 27001 SSAE16 compliant. In addition to our free plan, which includes unlimited signing, we also offer several premium plans that include more features & document sends. You can access information regarding our premium plans by tapping the “upgrade” button in app. •	Send documents out for signature. •	Access to advanced fields including DocuSign’s most popular. •	Manage signing on-the-go. Remind, void, in-person signing, and reusable templates. •	Powerful real estate features including zipForm(r) Plus integration and web branding. •	Managing signing on-the-go. Remind, void, in-person signing, and reusable templates. •	Limited document sending. Send up to 10 documents monthly. •	Access to essential fields. Request signature, date, and name. •	Reusable templates so you can standardize your documents.